For contact details please refer to the contact us page. 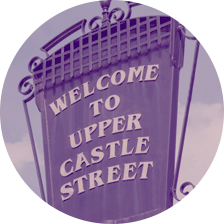 It all began in a premises at the top of Castle Street, Hinckley in Leicestershire. Starting out as a sole trader, Ian Fray created Ian Fray & Co Insurance Brokers. A local insurance broker that mainly dealt with general insurances. One aspect of the business that set us apart was a specialist classic car scheme for the members of the Triumph Car Club. The business had grown to a point where Ian was able to employ a few members of staff to help with the day to day running of things. One of the areas showing increasing popularity was the Triumph Car Club scheme. This helped establish a standing in the classic car community for being a reputable broker. The demand for classic car insurance was growing, and that side of the business was quickly dwarfing the general insurance side. A natural transition was occurring from being a local oriented general insurance broker, to becoming a national specialist broker. This new specialist broker image needed a new recognisable name and ClassicLine Insurance Services was chosen. It was also the first time the company donned purple. Now a firmly established classic car insurance broker, we were creating new specialist schemes for the market. One of the biggest was aimed at the Hot Rod scene in the UK. Together with the National Street Rod Association we built a members policy that provided the cover they were looking for. When it was released we also became the official insurance broker for one of the largest Street Rod/Hot Rod clubs in the UK. After having the same logo for well over a decade, it was time for a bit of a refresh. Our new identity that was created was bolder, more modern, friendly and approachable. Still kept the purple. Still at Castle Street. Still offering specialist insurance. Still purple.